I saw this clip on Todd Friel's Wretched Youtube page last night and it was extremely moving to me. It was also convicting, It DID spur me to check myself and examine as to whether I am in the faith. throw them into the fiery furnace. In that place there will be weeping and gnashing of teeth. By the way, when you study angels you notice how active they are in executing all God's commands, especially in Revelation. Anyway, in the clip, Dr Sproul explains why the weeping and what gnashing of teeth is. The weepers are weeping because they were self-deceived all along and were not saved when they thought they were. Jesus will declare to them, "Depart from me you workers of iniquity, I never knew you." (Matthew 7:21-23). Hence the urgency to check one's self to see if we are in the faith. (2 Corinthians 13:5). The gnashers are angry. They refuse to acknowledge God for who He is, even while they are justly tormented in the fires of hell. How can this be, one might wonder, when the entire lake of fire has been prepared by God for the devil and his angels, and the unforgiven sinners? The fires are real, they are in them. How can they not acknowledge God? The rest of mankind, who were not killed by these plagues, did not repent of the works of their hands nor give up worshiping demons and idols of gold and silver and bronze and stone and wood, which cannot see or hear or walk, 21 nor did they repent of their murders or their sorceries or their sexual immorality or their thefts. To make the depth of their depravity even more pointed, the next verse from Revelation shows clearly that they KNOW it is God sending the plagues, and they did not repent. Instead, they cursed his very name! They were scorched by the fierce heat, and they cursed the name of God who had power over these plagues. They did not repent and give him glory. (Revelation 16:9). And again in verse 11 when another plague was sent, they did not repent but instead cursed the name of God again. Instead, they began assembling at Armageddon to fight him! This all goes to show the power of sin. The power of sin to delude us as to its power. It can blind us. Am I self-deceived? Am I not in the faith? Will I hear those dread words 'depart from me?' Will I be weeping? Please watch the short video and ponder the gravity of it all. The cross of Jesus split history. It split the whole of humankind into two types of people- saved and unsaved. It split the world into Gospel-loving and hell-bound. The cross stands alone as the point of beginning or the point of departure. I thank God that there are and were men to preach the truth, even the unpleasant truths of scripture, such as hell, self-delusion, and false conversion. It's important. Now, how do we examine one's self? Further resources are listed below. Undoubtedly the sincere claims people make are sometimes far from reality. 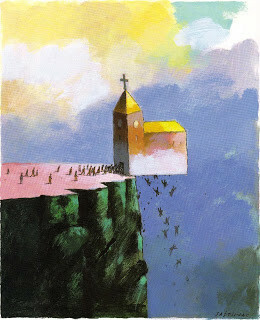 As chilling as that thought may be, there are countless well-meaning people who believe they’re saved, but they aren’t. Could you or someone you know be one of them? How do you know your faith is built on a solid foundation? Or is that something you can ever know this side of eternity? Determine for yourself whether you are a Christian. John MacArthur shows you how to assess your spiritual condition in Examine Yourself. If you don't want to read a 15 page booklet, here is a 5-page free booklet called Examine Yourself. If you don't want to read 5 pages, here is a 515 word essay from GotQuestions on What does it mean to examine yourself? If you don't want to read 500 words to examine yourself, then I direct you back up to the top to re-watch the clip, where there will be two types of people in hell. I'm not saying that if you don't follow through in looking at these particular resources you'l go to hell, but I'm emphasizing that the power of sin to delude us is great and must be constantly watched against. There is nothing more important than checking one's self to make sure we are not one of the two types. It's the best thing you could do all day or for all eternity. :) If nothing else, you will receive assurance! This illustration by artist Boris Sajtinac is all too vivid! Believe me, I checked myself immediately after watching the clip. I know the power of sin to delude me is too great. I've seen it happen to others and I know it dwells inside myself. Please, pray and check, and be assured, dear sister. Thank you for your comment here. I declined to publish it because I felt it contained slanderous statements that did not contain evidence. If you would care to continue corresponding via email that is always an option. Here is my reply. I appreciate your diligence in examining everything against scripture. I'm not above or below checking out any person where there seems to be issues, even those I have determined are solid, like the pastor you mentioned. If you would kindly provide some examples of where you've "heard [him] preach numerous false doctrines I know are wrong according to scripture" I'd thank you. I have heard him numerous times also and never heard anything false. I have heard him apologize, be gentle, humble, and expand on doctrines he once preached on in his youth, but nothing concerningly errant. If you could also provide some examples of your vague charge of "There are scary, evil-looking 'games' that the young people participate in, in rivalry at his youth camp and the [college]" and so on I'd appreciate it. Thirdly, your concern that "some of his 'Christian brethren' share the stage with well-known heretics, but he doesn't separate from them nor call them out for their lack of discernment" needs examples also. I have heard him call out people for false doctrines as well as heard his statement of having done so privately several times. I've heard him say that he has in the past pulled out of conferences where he refused to share the stage with people he is clear about needing to separate from. In regards this discussion about separation, Phil Johnson and Todd Friel have had several discussions lately on what biblical separation is and when to consider it, on "Too Wretched for Radio." I've found those conversations helpful myself. In my pursuit of discernment, I research thoroughly, so as not to be fooled, and I provide primary examples, not secondary evidence or hearsay. It is my opinion to date, that the pastor under discussion is one of this nation's most credible, solid, and positive exemplars of pastoral teaching of this entire generation. I am not fooled about this, I've done the same research on him as I have on other, false teachers, and he came out clean. If you can offer some credible examples that support your contentions I will certainly take a look! In fairness I promise this. As an important note, whenever I make a charge against a teacher, such as Beth Moore or Jen Hatmaker etc, I do so with the knowledge that IF I am wrong, I have slandered a brother or a sister, and I am due a just and Godly penalty. I pray that you consider that in your charge against him as well. Thank you for providing (via unpublished blog comment) background context and links regarding your charges against the pastor with which you have concerns. I have spent most of the day pondering them, researching them, and sorting through them. I thank you again for acquiescing to my request. --A. did you hear that yourself? Or did you hear that he said it, second hand? --B. how much research did you personally do afterwards, if that statement concerned you? Did you listen to other sermons, look for the context, consult the Bible etc? 2. When you looked at the link of the guy who posted about the youths at the college, how much research did you do? Did you look further, or ask questions of people who attend there? 3. When you looked at the link of the guy posting about Freemasonry, did you go to any of the original sources provided at that site? Investigate further? As regards the stance that children who die before they are able to cognitively understand sin and repent, I have heard that statement, I have listened to the doctrinal reasoning, and I have heard why after 9/11 it was a sound bite on the TV interview show. I have the book Safe in the Arms of God, a short book explaining the doctrinal reasons for the stance and written expressly to comfort parents who are grieving a young one. I can send it to you if you like. As regards the Youths, I personally know of a youth who attends college there and nothing occult is going on. I personally know of the behavioral expectations and moral standards required of the youths who live in the dorms. I know something of student life and the care with which the overseers and professors take of the youths. The college recently REDUCED their tuition so a greater quantity of kids could attend a morally wholesome and academically challenging environment. As for the photos, two of them are youths celebrating after winning a championship, one is an outdoor fiesta. Others in the camera scroll on the dorm FB page show youths having Bible study or watching PG rated family movies like The Sandlot. As regards Freemasonry, the connections and proofs are on a site from a guy who obviously has an ax to grind (part of discernment is assessing the credibility of sources). He makes tenuous connections strung together with nebulous claims, weasel words (a journalistic term) and allegations beyond credulity. As regards separating from unbelievers, or not partnering with heretics, none of the people you mention are heretics or are even false teachers. A helpful series of talks on proper biblical separation was held between Todd Friel and Phil Johnson, at Wretched. I offer them to you in hopes that will clarify your thinking on this issue. I am grateful that you cared enough to contact me with your concerns. However, your inquiry has inspired me to do a separate blog essay which I will title How to Do Online Discernment. If you are willing to throw out a solid ministry without having done your diligence yourself with primary sources, you're doing it wrong. If you are willing to throw out a solid ministry without knowledge of what true biblical, separation is, you’re doing it wrong. And I'm sad for you and worry for your future walk, because without discernment, and you do lack discernment, you are vulnerable. Please take heed regarding my previous warnings not to slander. Please be very careful as to the lengths you will go to propagate false information. I do thank you for contacting me and I do wish you the best of all best. Sheryl said: “Now I have some questions for you. Here is a quote: "I believe in volition (free will). I believe, anybody who wants to anytime, can come to Jesus Christ and receive Him as Savior." Yes the pastor in question said that, two and a half years into his 50-year ministry. He said it as a young man, and in context it makes even more sense than ripping it out from the 1972 sermon you copied and pasted it from. First, it is unfair and uncharitable to make a charge against someone who said something so early in his ministry, and then spent the next 47 years preaching its companion, the Doctrines of Grace. Secondly, if you believe that statement is heresy, you are condemning ALL Arminians as hellbound heretics, such as John Wesley. Most Arminians grow to accept the Doctrines of Grace at some point, as the pastor in question did, pretty early on. He has talked openly about that in sermons and Q&A sessions. It would be nice if you could display some mature balance. One sentence ripped from a 47 year old sermon and not preached that way again, compared to the millions upon millions of his words in sermons, talks, and books that preach the opposite. "How about this one: “Those who perish and go to hell, go because they are depraved and worthy only of hell and have rejected the only remedy, Jesus Christ; not because they were created for hell and predetermined to go there." So we aren’t depraved and deserving of hell? Secondly, that quote is from a 2003 book that answers the question from the two Peter epistles about the two parallel doctrines of election and man’s responsibility. Don’t forget, man has a responsibility just as God chooses, though we cannot reconcile the two, both must be discussed. You’re tending toward the one and forgetting the other. But both are covered in the book, you just focused on one narrow part of the discussion. None of this alarms you?! What alarms me is you. What alarms me is uncharitable people cherry picking quotes out of context and making charges against a solid ministry, a steady one with NO scandals, based on passed-around wonky websites, grainy pictures without provenance, aged Canadian newsletters, and persistently slandering it with no care, charity, or gentleness. What alarms me is that you think this is discernment. I am proud to quote this pastor and this ministry and all that grew from it. I’ll continue to do so. I’ve looked into your charges and found them baseless, and more than that, crass. If, in the future, something should happen to cause me to re-look, I will do so. But for now, I think it best we cease this conversation and that you cease from commenting on this blog. Thanks and I hope I’ve answered your questions sufficiently. I chose not to publish your comments because I do not want to put a stumbling block in front of weaker brethren by passing slander, conspiracies, and non-credible websites. Thanks for your attention and I do hope you continue reading the blog. If not, then all the best to you as you go your way. Been thinking a lot about this post, regarding examining oneself. I haven't checked any of your links (except the GotQs one), but rather decided to just reflect on my own with Scripture. What came to my mind were some verses from 1 John. I guess we can start in 1 John 3:14, but the verses that specifically came to my mind were verses 19-24. Since they hearken back (the "we will know by this", obviously looking back at preceding verses), it makes sense to read all the way from 1 John 3:14-24 (could honestly even go back to verse 1). It was a great reminder of one of the ways we can truly know we belong to the Lord. Well in general, I love 1 John, for the clarity of what it means to be in the light vs in the darkness. I guess I just found this passage encouraging, and wanted to share. Thank you so much for this info, and also for the other info you sent. I love the light vs dark concept too, so thanks for the scripture reminder of that one. You're welcome! The even more interesting part - I had been reading in 2 Corinthians when you posted this, and I was coming up on chapter 13. HA!